Last year at this time, things were crazy and I didn't post anything for Passover! This year, things are equally crazy but I am setting aside time to prepare for Passover and think about the upcoming holiday. Passover starts on Monday night, April 18th. That means there is still time to work on your menus and stock up your house with Passover treats. As I mentioned in my last post, I was thrilled to partner with The Urban Grape (a fantastic wine shop), Robin from Doves and Figs and Sara from Whole Foods Market in Brighton to put on a Passover Wine and Food Tasting. You can check out a recap of the event on their website. One of my contributions to the event was a write up of recipes to include in a booklet for all attendees to take home. I had fun putting together the recipes and want to share them with you as well. I hope you enjoy! For Passover celebration, I focus on both honoring tradition and bringing a modern interpretation to the holiday celebration. For me, that means keeping the basic structure and menu that my family had at their Seder, but changing it to reflect where I am now. For example, keeping the same menu, but using ingredients from the local farmers market. That gives a sense of place, and community to the meal. The recipes below take familiar Passover ingredients and put a new twist on them! Roasted beets and asparagus are bright, fresh spring flavors. Bright orange golden beets and the addition of orange infused olive oil ties the dish to the modern practice of including an orange on the Seder plate, to represent Miriam. This appetizer combines familiar items from the Seder plate in a new way. The bright red color of beet-horseradish contrasts beautifully with the bright green parsley and white hard boiled egg. 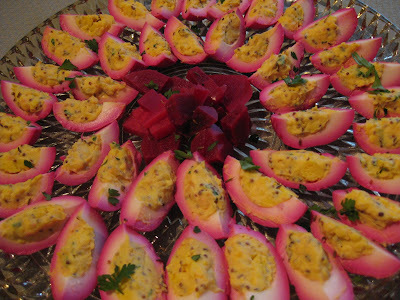 I plan to serve these eggs with the contrasting Beet Pickled Deviled Eggs that I made for Thanksgiving. I think the opposite colors will look great! This dessert is a standard offering for many families during Passover. Taking advantage of local maple syrup, this is a new take on an old favorite. Maple sugar can be found from local Maple Houses and is increasingly becoming available at grocery stores. *For the spice lovers, I made a few pieces of green chili maple chocolate matzo. I sprinkled green chili powder on the melted chocolate before sprinkling with nuts. It was delicious and I am thinking about making a full batch of spicy chocolate matzo crunch for next week! What's your favorite twist on a traditional Passover food or family recipe? I'm always on the lookout for new ideas! I love matzoh crunch. Definitely one of my favorite passover desserts. Yum! All of these recipes look SO good! They all look fantastic but that beet and asparagus appetizer blew me away. I love the colors and ingredients. Wow. Everything looks fantastic! I especially love those eggs and matzo crunch! Yum!! Ooh, I have matzo at home and might have to make those maple/chocolate ones. Yum. Everything looks beautiful, gorgeous photos! Golden beets are my favorite!!! Thanks for your note! I work @ BU too - so if you want to chat BU, marketing, or blogging we could meet up! happy upcoming passover. 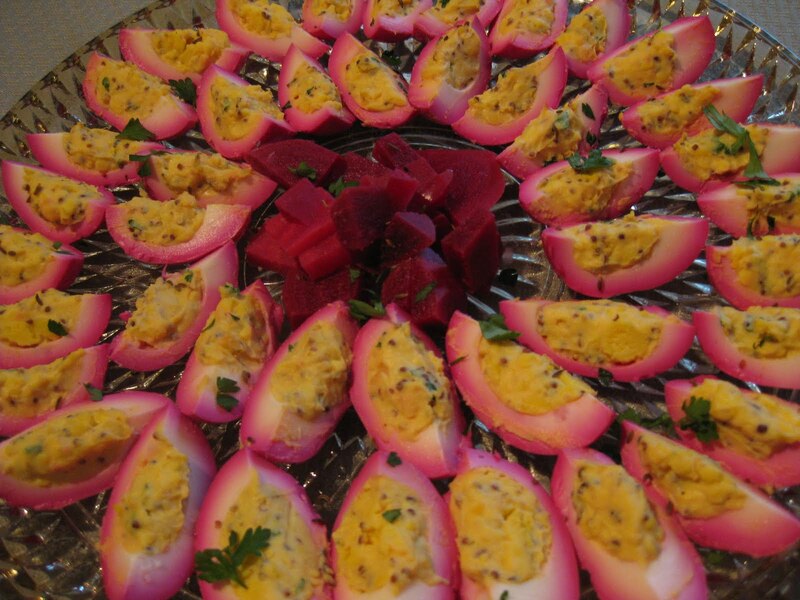 I'm going to be a bad Jew and not really do much for it, but I love the eggs and beet recipes. you guys have Seder? that is so awesome! all this food looks amazing, by the way.